In a market-oriented economy, entrepreneurs are the key individuals who initiate the production of goods and services to satisfy the wants of consumers. The entrepreneur combines the basic productive resources (natural, human, and capital) to produce goods and services he expects to sell for a price high enough to cover production costs and earn a profit. Profit is the amount remaining after all costs of production have been subtracted from sales revenues. Entrepreneurs face risks, and, therefore, many businesses suffer losses and eventually fail. Entrepreneurs may overestimate consumer demand for a product, or prices of productive resources may rise unexpectedly. Competition, government regulation, and other costs of business are often unpredictable. Entrepreneurs will produce goods and services only when the expected profits are great enough to warrant the risk incurred in production. In addition to profits, entrepreneurs respond to other incentives, including the opportunity to be their own boss, the chance to receive recognition, and the satisfaction of creating new products or improving existing ones. In addition to financial losses, there are other disincentives for entrepreneurs, including heavy responsibility, long hours, and the stress of running a business. Identify businesses in the community. Describe the goods and services the businesses produce. Select an entrepreneur and identify the productive resources the entrepreneur uses to produce goods and services. Invite an entrepreneur to visit and share his or her business experiences. Research various entrepreneurs and write a paragraph describing the goods and services the entrepreneurs produced. Describe obstacles the entrepreneur had to overcome. Draw pictures to accompany the paragraphs. Compare and contrast the difference between the work/responsibility of an entrepreneur and the employees who work for an entrepreneur. 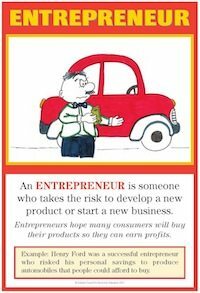 (Entrepreneur: comes up with an original business idea, takes the risk to raise money to start the business, makes major strategic business decisions; Employee: hired by the entrepreneur, doesn't bear the financial risk for the business, doesn't make major business decisions, etc.). Complete a writing assignment, beginning with this sentence: "Running a business is challenging because..."
Brainstorm and discuss reasons why businesses fail. Using a variety of scrap materials (ribbon, toothpicks, cloth pieces, wood, etc. ), become entrepreneurs by designing, creating, and selling new products.